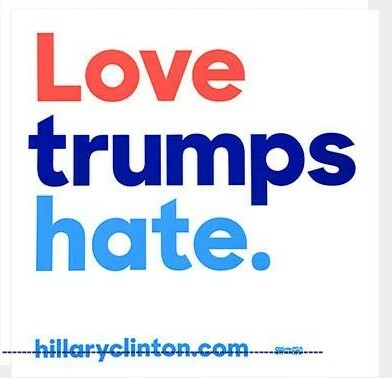 Perspectives : "Love Trumps Hate"
“Love Trumps Hate” Bumper Stickers on Sale For $1! 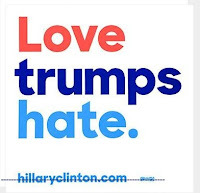 I truly believe that Donald Trump should buy these stickers and embrace the message of love over hate. Okay, he can cut off the bottom hillaryclinton.com stuff because it’s not about that bitter election anymore. It’s time to set a kinder tone in our nation with the news of Eric Trump being heckled, Trump supporters being accosted, and of course select Trump supporters thinking hate crimes are suddenly okay. I think it’s a motto that will work well for our President-Elect and will help him spread a message of kindness to all. You know he’ll be trying to “trump” everything he can. And did I mention these are on sale? He could probably get a really good deal since he used to be great friends with the Clintons. Seriously. Of course the money probably still goes to Hillary (who still needs all of the support she can get), but at least everyone who already bought one could continue to display it and feel hopeful.